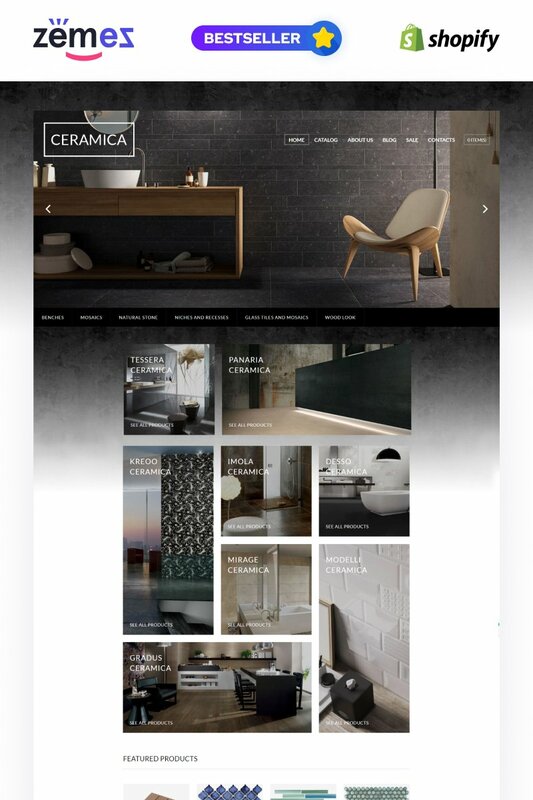 Ceramica is an ultra responsive construction tools Shopify theme, which was crafted with care to help you run a profitable building materials online store! It comes with a plenty of insanely awesome features. For example, here you get an easy-customizable homepage with variety of sections, so, you can create a stylish homepage of any complexity on the fly. Moreover, Ceramica comes with CSS Grid, therefore, feel free to choose the blocksâ€™ placement up to your taste. Simply, they will have a great showup according to design grid. This industrial Shopify theme has a pleasant & clean design and an enhanced navigation, so, your customers will stay focused on your building supplies and will find all necessary items in a blink of an eye. A neat contact form, a rich choice of Google web fonts, a newsletter subscription, and a plenty of other features will help you to lead in selling construction goods online. Whilst adding online chat inside of your information site, you raise the chances that you could be in a position to create a far better relationship with your potential buyers, thereby delivering an enhanced UX on your information site. Responsive design means that the internet page changes its size and shape to suit any kind of display screen, from the smallest devices to the largest Laptop computer monitors. For every single gadget, web page components get bigger or lessen to seem perfect. Responsive web page design allows you to enrich user experience and give a maximum access to the internet site information from any gadget. Bootstrap is definitely a completely free front-end framework that can offer for faster and also hassle-free website design practical experience. Can I customize the Shopify design theme for Design? Yes, you can customize the Shopify design theme for Design to any extent needed. You cannot use a header of the template for one project though, and images from the template for the other project. Is it possible to buy the particular image from the Shopify design for Home Decor Blog? No. According to our Terms and Conditions we never sell the images separately from Shopify design themes for Decor Blog (as well as the templates separately from the images). Are there any discounts if I'm buying over 10, 20, 30 or more Shopify ecommerce template for Home? Please email to marketing@templatemonster.com with your inquiries about Photography Shopify designs. Can I resell the Interior & Furniture Shopify theme as is? No, you cannot resell the Interior & Furniture Shopify theme as is. Do you provide any scripts with your Shopify ecommerce templates for Home & Family Blog or could you do some custom programming? Our templates do not include any additional scripts. Newsletter subscriptions, search fields, forums, image galleries (in HTML versions of Flash products) are inactive. Basic scripts can be easily added to a Home Decor Blog Shopify design theme at www.TemplateTuning.com If you are not sure that the element you're interested in is active please contact our Support Chat for clarification. Is it possible to use your Interior & Furniture Shopify designs to develop websites for my customers? Yes. It is perfect for designers who want to offer their customers a high-quality design and also save time and money. Keep in mind that when you purchase the Shopify design for Design News with ordinary or exclusive license you're entitled to create only one project (one domain name). What is the difference between unique and non-unique House Decor Store Shopify design purchase? Non-unique purchase:Non-exclusive purchase means that other people can buy the House Decor Store Shopify design you have chosen some time later. Unique purchase:Exclusive purchase guarantees that you are the last person to buy this template. After an exclusive purchase occurs the template is being permanently removed from the sales directory and will never be available to other customers again. Only you and people who bought the template before you will own it. What am I allowed and not allowed to do with the Design Blog Shopify design themes? You may: Build a website using the Design Magazine Shopify theme in any way you like.You may not:Resell or redistribute templates (like we do).Claim intellectual or exclusive ownership to any of our products, modified or unmodified. All products are property of content providing companies and individuals.Make more than one project using the same template (you have to purchase the same template once more in order to make another project with the same design). I like the image from the Shopify ecommerce theme for Design Supplies and would like to use it for my advertising campaign, can you send me this image in a higher resolution? No, we can't provide image in higher size or resolution rather than it is on the Shopify ecommerce theme for Design Supplies. We recommend looking for professional images on online photo resources. Can I apply a discount code to a discounted Shopify ecommerce theme for Decor Blog or combine several discount codes together to get better price? Can I resell the Shopify ecommerce themes for Design Magazine I bought the extended license for? No, you cannot resell the Shopify ecommerce themes for Design Magazine as is. You can only sell them as the integral part of your new product. Are there any limitations on selling the Family Shopify ecommerce theme as the integral part of my new product? Can I resell Decor Magazine Shopify design themes I bought the developers license for? You cannot resell the customized Shopify ecommerce theme for Design Supplies as a template, but you may sell it as a project to your client. What is the price for acquiring the extended license for Shopify design theme for Home & Family News ? There is no set price for acquiring the extended license. The price is based on the Shopify design theme for Home & Family News 's unique price for those templates you would like to use for the integration. The price for purchasing license for a single template is half of the template unique price. Can I resell the customized Design Magazine Shopify theme? No, you cannot resell the customized Design Magazine Shopify theme as a template but you may sell it as a project to your client (see paragraph 1 ONE TIME USAGE LICENSE for more details). Are there any restrictions for using imagery, cliparts and fonts from the House Decor Store Shopify design I purchased? All imagery, clipart and fonts used in House Decor Store Shopify design are royalty-free, if not stated otherwise on the product page, and are the integral part of our products. One Time Usage License and Developers License give you the right to use images, clipart and fonts only as a part of the website you build using your template. You can use imagery, clipart and fonts to develop one project only. Any kind of separate usage or distribution is strictly prohibited. What is a buyout purchase license for Shopify theme for Home Decor Catalog? If you purchase the product at a 'Buyout price' it guarantees that you are the last person to buy this template from us. It means that this Shopify theme for Home Decor Catalog may have been sold before a couple of times (see 'Downloads' number in item's properties) but only you and people who bought the template before you will own it. After this kind of purchase the template is being permanently removed from our sales directory and is never available to other customers again. The buyout purchase license allows you to develop the unlimited number of projects based on this template, but the template should be customized differently for every project. I have customized the Photography Shopify ecommerce theme and would like to protect my content by copyright, can I place Copyright, Mycompanyname.com? After Photography Shopify ecommerce theme purchase you can put your copyright to the template. But you cannot place a line at the bottom (or any other spot) of the customized project saying "Website design by Company name". Nevertheless, you can place "Customized by Company name". Make sure that these charges for Design Shopify theme have different order IDs. If it is so, contact our billing department. What is a unique purchase license for Home Decor Accessories Shopify template? If you purchase the product at a 'Unique price' it guarantees that you are the first and the last person to buy this Home Decor Accessories Shopify template from us. It means that this template has not been sold before and you become an owner of a unique design. After this kind of purchase the template is being permanently removed from our sales directory and is never available to other customers again. The unique purchase license allows you to develop the unlimited number of projects based on this template, but the template should be customized differently for every project. I ordered a Shopify design for Design News but haven't received the download information. In case of not receiving the download information of a Shopify design for Design News , please contact our Billing Department via support chat by phone or e-mail. What is a one time usage license for a Shopify design theme for Interior Design ? When you buy the Shopify design theme for Interior Design at usual price you automatically get the one time usage license. It enables you to use each individual product on a single website only, belonging to either you or your client. You have to purchase the same template again if you plan to use the same design in connection with another or other projects. When passing files to your client please delete the template files from your computer.